In the course of our reporting, another disturbing statistic [besides that of maternal mortality] emerged: For every American woman who dies from childbirth, 70 nearly die. 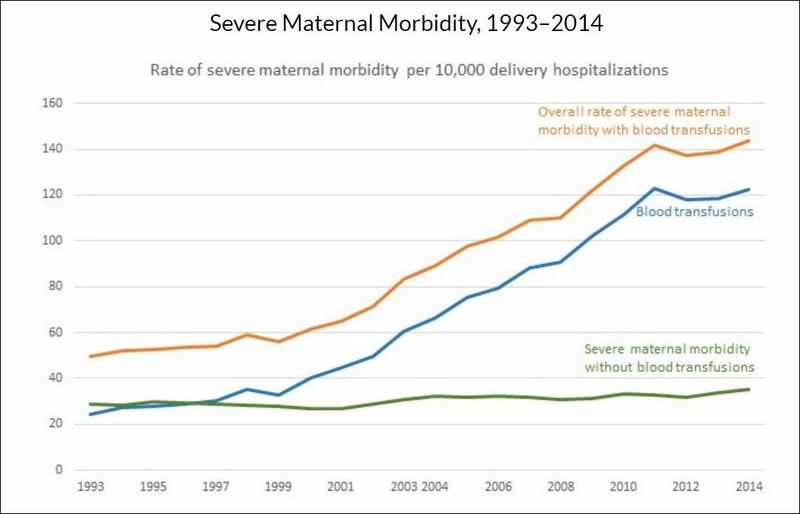 That adds up to more than 50,000 women who suffer ‘severe maternal morbidity’ from childbirth each year, according to the Centers for Disease Control and Prevention [see chart above]. A patient safety group, the Alliance for Innovation on Maternal Health, came up with an even higher figure. After conducting an in-depth study of devastating complications in hospitals in four states, it put the nationwide number at around 80,000. Women can wind up losing their uterus and therefore becoming infertile. They can wind up with kidney problems. They can have heart attacks. They can have brain damage from all the blood that they’ve lost. Women develop pregnancy-induced high blood pressure known as pre-eclampsia, which can lead to a stroke and organ failure; parts of the placenta can be left behind, which can lead to infection; and a woman giving birth is more prone to blood clots that can be life-threatening. The cost, though, is not just medical. The treatment for these complications can become an ongoing financial burden, and the trauma suffered from physical complications can lead to persistent emotional and psychological pain. NPR, Pro Publica, and more important the medical community itself have identified key matters that must be addressed to improve birthing care, a procedure that many would expect would be all but perfected since it has been a part of medicine since time immemorial. Doctors, nurses, and hospitals, to start, need to listen to and be much more responsive to women patients and stop ignoring or downplaying their health concerns. (That attentiveness and focus is a giant matter for Big Medicine altogether, as studies show, for example, that residents, who are frontline medical care givers, spend on average as little as eight minutes per patients per day, or just 12 percent of their total time, this at a flagship training institution like nearby Johns Hopkins). Specialists and researchers also are homing in on how little time new moms get in pre- and post-partum care, where their medical and other issues could be dealt with early, fast, and before they get out of control. In my practice, I see not only the significant harms that patients suffer while seeking medical services but also their giant struggles to access and afford safe, quality, and excellent medical care, especially attention that could avert serious and needless injury to moms, babies, and children. 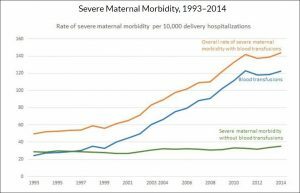 Others already have noted how much more parents and families pay for maternal services in this country versus other industrialized nations, and the, frankly embarrassing and disconcerting disparities in outcomes in which this nation ranks so poorly against its peers on measures of maternal mortality. If any smug guys exist who think that pregnancy and delivery is easy and plain simple, they might wish to consider reporting by the Denver Post. The newspaper, serving a state that has led in the legalization of marijuana, says that researchers have found that hundreds of pot stores, when contacted by an unidentified female caller, recommended marijuana ingestion for expectant women customers suffering with morning sickness or pain. Medical expects explicitly say this should not be done. But the pot sales people, in multiple “mystery caller” chats with medical researchers from universities and health systems in Colorado and Utah, offered “personal recommendations” on marijuana and pregnancy, no matter what scientific studies may show about its potential harms. To be sure, many Americans deride discussions of marijuana risks — which do exist, as Aaron E. Carroll, a research scientist and professor of pediatrics at Indiana University School of Medicine, pointed out in a recent piece for the “Upshot,” the New York Times column on evidence-based findings. Carroll doesn’t take a position on pot legalization, but as a physician-researcher, he says users must educate themselves about the substance and its potential abuses and health dangers. And, if legal pot is creating concerns for pregnant women and their unborn, it’s worth reading reports by the independent, nonpartisan Kaiser Health News Service and the New York Times magazine about a growing number of young, expectant moms’ struggles with opioid addiction. On average, a baby is born every 15 minutes in the U.S. withdrawing from opioids, according to recent research. That staggering statistic raises concerns among doctors, social workers and mothers … who worry about how drug abuse while pregnant affects a baby’s health. … Research is just beginning to point toward the answers. A recent international multi-site study tracked nearly 100 children and their mothers, who were in medically assisted treatment during their pregnancy, for 36 months. Hendrée Jones is executive director at UNC Horizons and co-authored the study. She offered reasons to be optimistic. ‘The children through time tended to score within the normal range of the tests that we had,’ Jones said. But the news service quotes other experts who say children can suffer developmental delays, and research on opioids’ effects on pregnant moms and their youngsters is a newer area with much to be learned still. Of the estimated 2.1 million Americans currently in the grip of opioid addiction, many are women of childbearing age. The young-adult population has been hardest hit, proportionately, with nearly 400,000 adults ages 18 to 25 suffering from addiction to prescription painkillers (the vast majority) or heroin. Strict adherence to a birth-control regimen — or any regimen at all — is difficult for someone whose body and mind have been hijacked by drug dependence, which may help to explain why, according to the largest recent study, nearly 90 percent of pregnancies among women who abuse opioid medications are … unintended. The number of pregnant women using opioids grew significantly between 2004 and 2013, according to recent research published in JAMA Pediatrics, with the increase disproportionately high — more than 600 percent — in rural areas. Another decade-long study found a fivefold increase in the number of newborns who experienced the opioid-withdrawal condition known as neonatal abstinence syndrome, or NAS: to eight per 1,000 hospital births from one and a half. Experts estimate that a baby with NAS is born in America every 15 minutes. We have a long way to go to help moms and kids in this country.